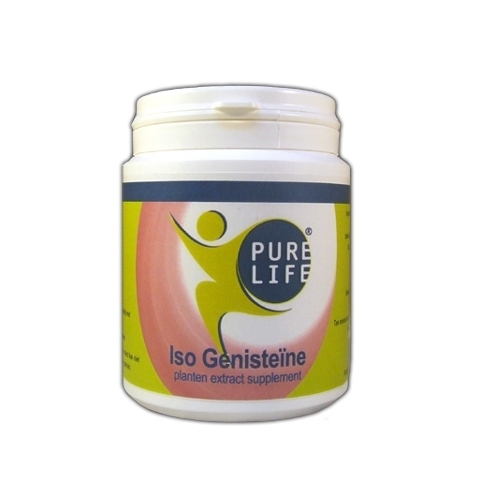 The main ingredient of Iso Genistein is a soy protein. The soy plant has an upright hairy stem that is occupied with three leaves. The fruit is a pod with different colored seeds, called soy beans. The soy plant can only be successfully grown in warm regions. The soybean can be processed into a large number of different products. Under the 'Additional info' tab you can find any allergens present and the advice for use. In connection with the new legislation that came into effect on December 14, 2012, the product description of this product has been adjusted. We unfortunately can not tell you everything about this beautiful product. You can request additional information about this product by filling in your e-mail address. The product itself is not adapted, it still has the same high quality. Ingredients per recommended daily dose (= 1 capsule): soy isoflavones 40% 250 mg (= 73% of the total content), quercitine dihydrate 30 mg and excipients (Mcc 145 mg, silicon dioxide 5 mg and talcum 5 mg). Plastic jar with sealed lid. 1 to 2 capsules per day with water. Keep dark at room temperature.